Looking for our weekly jewel roundup? It's still the middle of the summer slow season; we'll be back with another fortnightly roundup next Friday! Queen Maxima of the Netherlands is currently on a visit to Indonesia, where she's acting as a special advocate for the United Nations on the topic of financial inclusion. Here's a look at some of the bejeweled pieces she wore during yesterday's meeting with President and First Lady Widodo at the presidential palace in Jakarta. 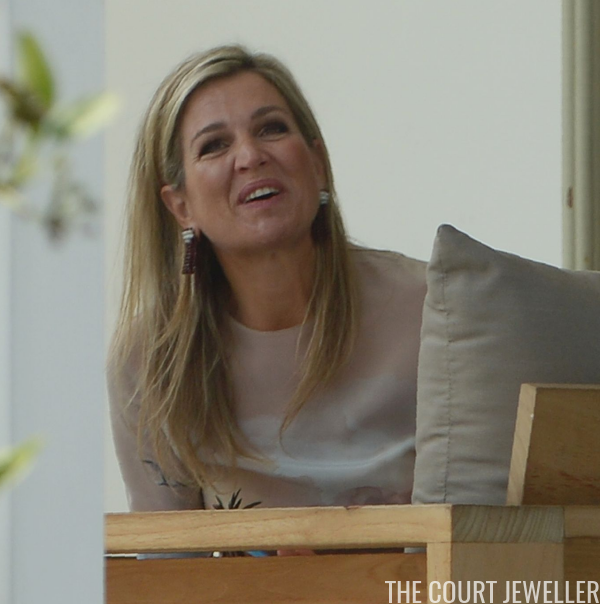 Maxima wore one of her favorite pairs of statement earrings, which feature beaded tassels -- possibly garnets -- gathered together by a set of diamond bands. We also got a glimpse of a major ring on her right hand. The ring, which features a large orange gemstone, was a gift from her husband, King Willem-Alexander, to celebrate the birth of their second child, Princess Alexia.